A few weeks ago an old student I had in middle school emailed me to say she needed to write an essay for extra credit. It had to explain something to her audience and she had been thinking about libraries and librarians lately. And how boring it seemed to be a librarian and why would anyone want to be one. She interviewed me and recently sent the following essay, reprinted here with her permission. (Note: I did not edit her piece in any way.) Enjoy! Every time I stepped into a library I would always hear a librarian shushing some one or I would see the librarians organizing books one at a time very slowly. I would ask myself why they decided to become a boring librarian, but of course I was seeing them from the wrong point of view. What I see from my point of view is just a librarian with a boring job telling anyone that makes a small noise to shush up and follow the rules, but from their point of view they love their job and have plenty to say about it. I’m guessing they’re the one’s who made up the saying, “Never Judge a Book by its Cover.” But every librarian has their own way of saying that they love their job. And so I started thinking, why choose to be librarians? Are all librarians the same? How did they become librarians? What do you have to do to become one? And is it a good job being a full time librarian? Where would I find this information? What I first ended up doing was e-mailing my great friend Elizabeth Zitron, who happens to be a librarian. She answered all my questions that I have asked. I was surprised on what I learned about librarians. First I asked her how she became a librarian. Her response was that first off, she had to graduate school for two years to get a Masters in Library Science. She studied plenty of things such as, how to organize and catalog books like the Dewey Decimal system; how to build computer networks; choosing and using books for kids of all ages; how to help people find information and much more. She had to make sure she had to attend a school that was recognized by the professional organization The American Library Association. The American Library Association recognizes as a school that undergoes a review process to make sure that librarian know everything about being a librarian. Well, becoming a librarian wasn’t going to be easy, but every person who wants to be a librarian has to go through librarian boot camp. I think its cool having that much knowledge on how to use that knowledge to organize and stuff. I have always wondered that all librarians were the same, but I was proven wrong, again. This leads to my second question, that if a librarians were the same. Elizabeth explained to me that there are many different types of librarians and that they are not the same. 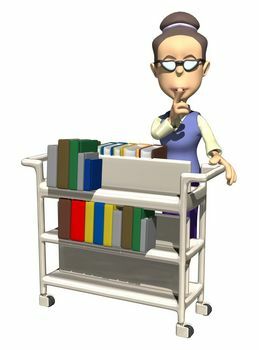 A few types of librarians include: Children or teen librarian; School librarian; Archivist; Conservator; Academic librarian; and Public librarian. I was surprised to hear that these were only a few. Well, first she explained that a Children or teen librarian works only with little kid and teens. They help them find books meant for kid and teens or they help find information for school projects or homework. Second she explained what a School librarian did. School librarians, of course, work in a school library. They help out teachers and students in the library. They help teachers use the library for their classes and help students with school projects. They also keep good books on the organized shelf. Third she told me what an Archivist is. An Archivist is a person who takes care of a specific collection of book, for example stickers, scrolls, stamps, even 1960 band equipment. The next subject on the list is Conservator. A Conservator helps recover thing such as books, important papers, old maps and sculptures. They are like the doctors for books. They might not make the original, but like I said they are the doctors for books. They help recover anything that’s missing. Let’s say that you run into a 400 year old statue that has some missing or damaged pieces, those doctors can make it look like new. I think this is a pretty cool job. Elizabeth is an Academic librarian. An Academic librarian is some one who works in a community college or university. They do all sorts of things from helping students to do research to making sure there are books and other items on the shelves for student and professor if they need anything. I thought this was the coolest job out of all of them because she get to do fun stuff like host parties, host a half-time trivia contest at basketball games. She said that the library that she worked last year they had video game consoles in the library like the Wii, Nintendo 64, PlayStation 3, and X-Box. In the library students could check out games and controllers and play them during study breaks. She had made signs saying, “We’re here to help you, not to shush you!” And last but not least, Public librarian. A Public librarian is someone who works in a Public library. They are sort of like school librarian except they do a bit more. They set club meetings; bring special speakers and much more. There all other kinds of librarians but these are the main ones. I liked them all. My final question, was why you wanted to be a librarian in the first place? She answered me happily that she decided to become a librarian while she was working for the City of Eugene Recreation dept running programs for young people. Elizabeth loved working with teens because they are interesting and challenging. The relationships you can form with them are much more rewarding to her than with younger kids. I worked with public librarians who helped support some of her fun programming with literacy activities. Elizabeth became friends with one and he convinced her to become a librarian. He said it combined her past experience working as a book editor with her current position working with youth. She interviewed him about his job and he convinced her that this was my path. He was totally right! She got to work with college students now, helping them to succeed in school and other areas, and she got to work with all sorts of pieces of information from books to statistics. She never realized being a librarian was a real job ad required going to school to get a special degree. She is so glad that librarian helped her find her passion to be a librarian. Maybe other librarians have other reasons to be a librarian or may be similar, but this was her reason to be one. After this essay I learned a lot about librarians. I found out things that I couldn’t even imagine a librarian doing. I mean was surprised to see what librarians could do and how many kinds there are. Librarians can be incredible people except if the charge you a lot for an over due book that still hasn’t been turned in even though its been like five since that has happen, but now I now the true facts about librarians, that librarians aren’t just librarians.